More than 1,000 families attended Akron Children’s Hospital’s NICU reunion on Sunday, Oct. 21, 2012, at the Summit County Fairgrounds. The oldest NICU “baby” was 36 and the youngest ones were still in diapers. 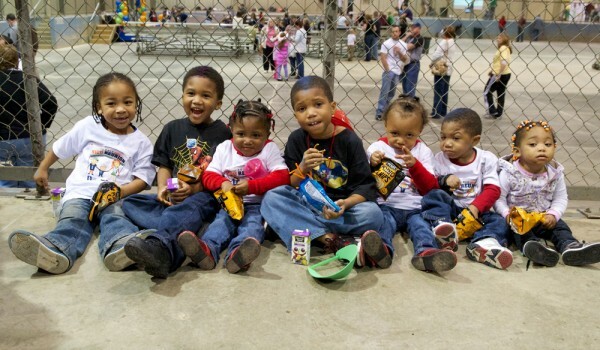 The newborns, toddlers, kids, teens and adults who arrived at the Summit County Fairgrounds Sunday with their families had one thing in common – they had spent some of their earliest days after birth in one of Akron Children’s neonatal intensive care units. The event was a love fest with seemingly endless hugs, smiles and kids posing for pictures with the doctors and nurses who had cared for them. The kids danced, made crafts, visited with members of Akron Children’s Doggie Brigade and had the opportunity to climb inside a fire engine and one of Akron Children’s mobile intensive care units. More than a 1,000 NICU graduates and their families attended. Doreen Vernotzy and her son, Travis, wanted a picture with Dr. Anand Kantak, medical director of the NICU. Travis, now 22, was born 14 weeks premature in 1990 and spent his first year of life in the NICU. He was discharged and sent home, only to get a respiratory infection and had to return to Akron Children’s pediatric intensive care unit – for another year. Katie Gauze was looking forward to seeing neonatologist Harriet Feick and the nurses who helped her son, Blake, get through his ordeal of being born with a diaphragmatic hernia. He had to spend two weeks on a heart and lung machine. Little Lillian Love, 5, has become very attached to her NICU nurse, Colette Benincasa, one of the reunion organizers. She often tells her parents that when she grows up she wants to be a nurse and drive an ambulance just like her “guardian” angel, Colette, who is also on the hospital’s transport team. Meanwhile, 21-month-old triplets Meredith, Coraline and Ellena Wakefield came from Boardman with their mother and grandmother in hopes of reuniting with Kristie Stefan, March of Dimes family support coordinator. While all three girls spent time in the St. Elizabeth Hospital NICU and the special care nursery at Akron Children’s Hospital Mahoning Valley, a bad case of reflux brought Coraline to the Akron NICU for more specialized care. The reunion included refreshments, games and crafts, and remarks by retired NICU director, Dr. Gary Benfield, Dr. Kantak and chief nursing officer Lisa Aurilio. Many children carried photos of themselves as preemies – photos that are getting placed in a scrapbook that will stay in the NICU as a reminder of precious babies who spent their first days at Akron Children’s Hospital. 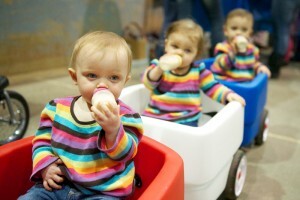 For an additional 90 images from the NICU reunion see this photo gallery.